Just polished off the last of the leftover Thanksgiving turkey. The pizza place will be pleased. They've missed us. Thursday: Ate a lot. We calculated that there was enough food for each of us to have 2 pounds of turkey, 10 meatballs, 5 slices of beef, 3 pies, and 6 tons of stuffing. We're good eaters here. Friday: Book signing at the Borders in Meriden, CT. Great place for a book signing, and a great day for it too. This Borders is in a mall so there was quite a bit of foot traffic on Black Friday. The super-nice Borders folk set me up with a lovely table right near the mall entrance. I talked to lots of people. In fact, I found myself saying hello so often that at one point, I realized I'd said hello to a Children's Place shopping bag. (It had photos of people on it and was carried by right at my eye level.) Thankfully, the bag did not reply. Saturday: Reading and signing at the Borders in Shrewsbury, MA. Another great store with super-nice staff. They set up a big, beautiful rack of my books in the reading area, and then wheeled out a handcart full of Into the Wilds to the front of the store for the signing. I really, really wanted to build a big, beautiful, purple igloo made of copies of Into the Wild around me, but a little voice in my head whispered that that might be a tad unprofessional. The little voice in my head was undeterred by the fact that having little voices in one's head is also a tad unprofessional. Sunday: Apologized to family for spending most of the weekend at bookstores. Returned home. Next blog post: Tuesday's visit to Bancroft School in Worcester. Collectively, these stand for: Sarah Meets Lots of Incredible People. Individually, they stand for Teen Author Drinks Night, National Council for Teachers of English, the Assembly on Literature for Adolescents (anyone know what the N stands for??? ), and Science Fiction and Fantasy Writers of America. Friday night: Hung out with YA/MG authors at a New York bar way cooler than I am (actually, both the authors and the bar are way cooler than I am, but both the authors and the bar are way too nice to comment on that). Met Pete Hautman, Mary Logue, Laura Ruby, and Tanya Lee Stone for the first time. Chatted (okay, shouted -- bars are loud) with lots of authors I've met before including Holly Black, Cassandra Clare, Sarah Rees Brennan, Coe Booth, Scott Westerfeld, Tara Altebrando, Lisa Ann Sandell, David Levithan, Sarah Aronson, Justine Larbalestier, Alaya Johnson, and more. Yes, there was vodka pizza. 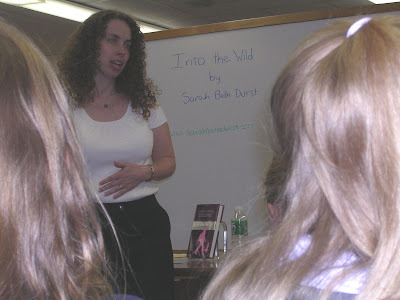 ME: Hi, I'm Sarah Beth Durst. I love your books. I've loved your books for a long time. I love books about fairy tales. I wrote a book that involved fairy tales. I'm a writer. I have a book. I love your books. GAIL CARSON LEVINE: Thank you. If others surface on the internet or in my Inbox (hint, hint), I'll post them too. Sunday afternoon: food and drinks. I treated myself to a lovely lunch at Sarabeth's, my favorite Manhattan restaurant, and then wandered down to Times Square (no particular reason -- I just like how shiny it is). En route back from Times Square, I heard someone say, "Hello, Sarah." I nearly ignored it because, well, it's Manhattan, and what were the odds of seeing someone I knew? Apparently, the odds were good because it was Jordan Sonnenblick (great author and great guy). So I dragged him with me to the next party, a Kidlit party at a bar called Faces and Names. Again, I talked with a variety of editors, agents, and writers. Got to hear the story of how Newbery winner Linda Sue Parks shimmied against Collin Ferrell in an elevator, told by Linda herself. Also saw Rebecca Stead, Longstockings Daphne Grab and Lisa Graff, and School Library Journal blogger Betsy Bird. Only thing I didn't like about this bar was the bathroom. I hate large single-stall bathrooms. I like to be in easy reach of the door in case the lock should fail. (Is this just me? Am I totally neurotic?) This particular bathroom faced the bar with no hallway or anything. If the lock had failed... It didn't, but I had terrible nightmares that night. Best part of the evening was that all the authors got to wear bright red pins that said "Author! Author!" I put mine on and swore never to take it off. (Okay, it's off now, but I wore it the whole train ride home.) I talked to more teachers, librarians, editors, and yes, more authors: Michael Buckley, Debby Garfinkle, Maureen Johnson, and others previously mentioned. The lovely Penguin folk invited me to the Penguin Family Dinner, an annual post-NCTE tradition. 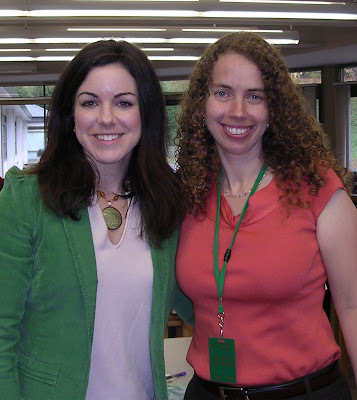 Other authors in attendence included Laurie Halse Anderson and Sara Ryan. We went to the restaurant next to the ice rink at Rockefeller Center. I wish I'd saved the menu. It had the Penguin logo on it. Very cool. In fact, the whole dinner was very cool. On Monday, I headed back to New York for the annual SFWA NY reception, which was stuffed to the gills with writers, editors, agents, etc. Authors I talked to included Marvin Kaye, Bud Sparhawk, Roger MacBride Allen, Bill Wagner, Leigh Grossman, Keith DeCandido, Laura Anne Gilman, KZ Petty, David Keck, Beth Bernobich, Rose Fox, Diane Turnshek, Alexandra Honigsberg, Glenn Hauman, Terri Osborne, Paul Witcover, Delia Sherman, Ellen Kushner, Jane Jewell... I'm sorry, but I'm not going to remember everyone. Suffice it to say, lots of awesome people were there! Here are two of the highlights: first, I got to hang out for a while with Jane Yolen (amazing person and author of something like two billion books -- okay, maybe only 200+). Second, I won one of the door prizes (a bottle of wine and a Society of Illustrators T-shirt) for being the only person in the room with a first novel published within the last twelve months. They handed me a microphone and told me to say my name and book title. It was all I could do to resist performing the Snoopy Dance of Joy right there while shouting, "I'm real! I'm real! I'm real!" Next up: Thanksgiving. Hope you all have a marvelous Turkey Day! Last week, I was offered a free book by a bookstore. Any book in the store. Mine for the taking. Mwah-ha-ha! Sorry, sorry -- couldn't resist. The real story is that last week, I was a guest speaker at the University of Connecticut. Leigh Grossman (author, president of Swordsmith Productions, adjunct professor at UConn, and all-around nice guy) invited me to speak to two of his classes (Expository Writing and Fantasy Literature). Afterwards, I did a reading/signing at the UConn Co-op Bookstore. After the classes, I did my event at the Co-op bookstore. The Co-op knows how to do events right. They had a fabulous and huge sign for me, and a lovely centralized event location with a podium and microphone for the reading and a comfy chair and table for the signing. When I finished, they told me it's their policy to give all writers who do events there a choice of any book they want from the entire store. I immediately set off on combing through all the aisles, dragging poor Leigh with me. Three laps later and one trip upstairs to textbooks, I was in a state of near panic. Free book! But which book? What if I chose wrong? What if I regretted my choice forever and ever? Yes, my friends, faced with the offer of a free book, I was desperate not to blow it. I wanted them all, all, ALL! In the end, I settled on a gorgeous annotated volume of Hans Christian Andersen tales, edited by Maria Tatar. But now I'm curious... What would you have chosen? Given the choice of any book in the store, how would you have decided which one to get? Oh, and by the way, this weekend I'm off to the NCTE (National Council of Teachers of English) convention in New York City. If any of you are going to be there, and you see me wandering around, lost and confused, please come over and say hi! I started attending conventions in 1998 because of Terry Brooks. I'd met him at his book signing at the MIT Coop Bookstore for his book Running with the Demon. He was one of the very first Real Live Authors that I ever met. I remember that I circled the store twice before I got up the nerve to talk to him. (I also remember I was wearing an Alice in Wonderland T-shirt. No idea why I remember that. Some details just stick. Like 80s song lyrics.) I confessed that I wanted to be a writer, and he was immensely kind and encouraging. One bit of advice that he gave me was to start attending conventions. Meet people in the business. Learn about the business. I'm not saying all this for pity. I'm saying this out of pride. IT WORKED. Through sheer stubbornness, I met people. And more people. And more people! This past weekend, I went to the World Fantasy Convention in Saratoga Springs, NY, and it was AWESOME. I swear that I couldn't walk two feet without seeing someone that I knew. No looking at program guides, no random circling, no PB&J (which I don't even like) in the car. In fact, one day, I actually had lunch twice. (Not a hardship. I'm like a hobbit when it comes to food: I like first lunch, second lunch, tea, supper, dinner...) I got to spend time with people who I both like and admire. It was awesome. The best event at World Fantasy is the Friday night autographing session, in which all the authors plop themselves down at a table, set up a table tent with their name on it, and sign books (or programs or T-shirts or napkins) for whoever asks. I've always loved this event. Tons of authors trapped behind tables, unable to run away when you want to talk to them! Mwah-ha-ha! This year, though, it was very different because I (finally) qualified to be one of the people behind the tables! I spent the majority of the time bouncing up and down in my seat like a deranged Gummy Bear from that 80s cartoon. I couldn't help it. The whole time, this little voice inside me was shouting, "I'm real! I'm real! I'm finally real!" I loved every single second of it. And I also loved where I was sitting. Here's a photo of me at the signing. Please note the awesomeness of the two people that I'm sitting between. And FYI, by sheer coincidence, all three of us sign with purple pens! On Saturday, I was on a panel with Tim Powers, Elizabeth Bunce, Margo Lanagan, and Mark Ferrari (all smart and cool people). We had a full audience, and we had microphones. Somehow, we managed to resist the urge to spend the hour singing Broadway show tunes (okay, maybe the others weren't tempted, but c'mon, microphones! ), and instead we discussed archetypes. We posited that if you drill them down far enough that they become universal and are therefore really powerful writer's tools because they tap into basic wants and needs stored in our lizard brains. I'm reasonably certain that I avoided sounding like an idiot, which (as always) is one of my primary goals as I approach each day. Afterwards, a girl approached me as I was leaving and asked me to sign her book. This was AWESOME. For years, I have been watching writers be approached by readers after panels. And now it happened to me. YAY! It felt kind of like a coming-of-age moment (for me, I mean -- it probably wasn't nearly that meaningful to her, though her dad did take a photo while I signed, which was extra cool). A couple hours later, I had my reading. I was part of a joint Young Adult Writers reading with Holly Black, Cassandra Clare, and Tiffany Trent. I was really, really nervous for two reasons: (1) I planned to read from my upcoming novel, Out of the Wild (the sequel to Into the Wild). I'd never read from Out of the Wild in public before. In fact, the only people who had ever seen any part of Out of the Wild were my editor, my agent, my husband, and my cat. So I had no real idea how it would be received. (2) We had a full and star-studded audience, including Scott Westerfeld, Tamora Pierce, and Jane Yolen. I very nearly chickened out and read my usual scene from Into the Wild. All through Holly and Cassie's excellent readings, my brain was going, "Into the Wild or Out of the Wild, Into the Wild or Out of the Wild, Into the Wild or..." If there had been any telepaths in the audience, I would have driven them insane. Of course, the highlight of all highlights was the people. Over the course of the weekend, I got to spend time with the wonderful Tamora Pierce. She's on my list of Favorite People in the Entire World. She's awesome. One evening, we saw a thousand geese fly over head. We watched skein after skein of them sweep over the whole of the sky. She didn't move until the last goose was gone -- that's the kind of awesome that she is. With anyone else, I would have felt like I should move along, but she understood how magical it was. A side note: on the drive up and back to Saratoga Springs, I listened to her newest novel, Melting Stones, which was released first as an audio book from Full Cast Audio -- I highly recommend it. Luvo, the heart of a mountain, is one of the best characters she's ever created. And Full Cast Audio doesn't do ordinary audio books. It's not a single reader; it's (as the name implies) full cast, which means it's like listening to a stageplay. It's Bruce Coville's company, which brings me to another awesome-people highlight of the con: Bruce Coville and his daughter Cara, two super-fantastic people. I walked around the art show with them on Saturday and discovered that Cara and I have similar taste in art. Check out this rabbit by Omar Rayyan. I also got to hang out quite a bit with Holly Black, Cassie Clare, Josh, and Sarah Rees Brennan. They're all so great. They totally make me laugh. Sarah and I had an extended conversation about harpooning leprechauns. (Probably best if you don't ask.) Holly and her husband Theo had a party in their room each night of the con. Friday night was the largest party and included Tiffany Trent, Catherynne Valente, Scott Westerfeld, Christopher Barzak, and others. Very, very fun. Tiffany was one of the first people who I saw at the con. She's super-sweet. She also hangs out with bears (her husband's a wildlife biologist), which means she's also super-cool. I am jealous. I want a bear. Actually, that's not really true. What I really want is a dragon. But the griffin would probably object. Actually, to be totally technical about it, she wasn't the first person I saw at the con. She was the first person I spoke to because of that handy-dandy snazzy invention called the cell phone, but the first person I saw was Eugene Myers (who wins extra bonus cool points for having read my blog before coming to the con). Second person I saw was the always-sweet Delia Sherman, who introduced me to Patricia McKillip. Guy Gavriel Kay was staying on the same floor of the hotel as I was so I ran into him by the elevators several times. First time I saw him, I sort of totally embarrassed myself by doing the total fangirl gushing thing. But he was really nice, and I got to talk with him several times in passing throughout the con. I also did the fangirl gushing thing at Ruth Sanderson, my favorite artist (alongside Claude Monet, who probably doesn't attend cons very often). We traded books during the autographing session (I gave her a copy of Into the Wild and signed it, and she gave me a copy of her beautiful Snow Princess and signed it). Got to chat several times with David Coe, Michael Jones, and Christopher Golden, all of whom are really great, as well as the fantastic folks from SFRevu (Gayle, Paul, and Drew). Also met the very nice J.V. Jones and the super-sweet Maryelizabeth Hart from Mysterious Galaxy. And talked to Rob Sawyer, Diana Pharaoh Francis, Laura Anne Gilman... okay, if I try to list everyone, I'm just going to fail so I'm going to stop here and just mention one more highlight: on Sunday, I went for coffee with Garth Nix!!! I'd never met him before this weekend, but I adore his books and I was very happy to discover that he's extremely nice. All in all, I'd say this was a vast improvement over my PB&J-in-the-car days. Can't wait for the next con! On the fifth and final day of my Northboro Schools adventure, I went to Melican Middle School to speak with lots and lots of sixth graders. Here's a photo of me speaking. I don't know why I have my hand on my stomach. I think I'm reminding myself to stand up straight. Can YOU rub your belly and give a presentation at the same time??? Aside from being awesome in its own right, this visit was super-awesome because this school is my main character Julie's middle school. In my book, Julie is a seventh grader at Northboro Middle School (which is what Melican was called in my day) and part of the book is set in this very school! I loved being able to tell the students that chapter three starts right here! And that concludes my Week of Awesomeness. I did a total of 20 presentations and talked with 600-700 students. I ate a chicken patty sandwich that tasted exactly the same as it did when I was in elementary school (not bad, actually -- I always kind of liked chicken patty sandwich days. Now shephard's pie is another story...). I visited the Agway rooster and drove past the former Dairy Hut (now Beezer's) and the White Cliffs Restaurant (all locations in INTO THE WILD). And I only cried a couple of times ... all very happy tears. Thank you so much to all the students, teachers, librarians, PTO enrichment coordinators, principals, booksellers, and everyone else who made this fabulous week possible! On the Thursday, I visited Proctor School in Northboro. To my ultimate embarrassment, I got lost on the way. (I swear it didn't look like a dead end on the map!) Lost in my own hometown. Sheesh. Luckily, though, I tend to leave for places ridiculously early -- I'm the one who shows up at the airport three hours before the flight -- so I was perfectly on time. Like Lincoln Street, Proctor had an awesome surprise for me. I set up for my presentation in the library, the third graders walk in with their teachers, and I turn around and see that one of their teachers went to elementary school with me! It was very cool to have someone from my Northboro elementary school days right there in the audience. Kind of gave a full-circle sort of feel to the day. We last saw each other back in fifth grade, when I was first deciding that I wanted to be a writer. I sat in the parking lot for a few minutes, composing myself and reminiscing about the playground (we used to play jumprope over there and Electricity on the manhole covers over there, the girls used to chase the boys around that tree, my friend Gillian and I used to make little houses out of dandelions just over there...). Then I got out of the car and took pictures of the sign. I even figured out how to send a photo with my cell phone so that my husband could see the sign. I was in school here when I decided that I wanted to become a writer. I wrote my very first story in classroom number 1, Mr. Bostock's fifth grade class. He was the teacher who first encouraged me to write. He's directly responsible for who I am today. And I got to thank him in person. He's retired now, but his daughter-in-law teaches fourth grade at Lincoln Street School, so he came in to her classroom when I was between presentations. Of course, I nearly cried. It was so phenomenally awesome to be able to say thank you to someone who had such a profound influence on my life. Okay, that was actually from "The Life and Times of Juniper Lee" (my all-time favorite, albeit short-lived, TV show -- it's essentially "Buffy the Vampire Slayer" minus the whining). But wouldn't it be awesome if there really was a convention for imaginary characters? Saturday 1pm - Panel: There's an Archetype in My Soup! Much fantasy deliberately employs elements of fairy-tale and myth, often after much scholarly research. But there's still the old argument that if you have to learn an archetype, it isn't one, that these patterns are universal in human storytelling. What is the mythic "buzz" we all know when we see it, even when we have difficulty defining it? I'll also be signing books at the group autographing session on Friday night from 8-11pm. If you'll be at WFC, please drop by and say hi!